Wind farm siting varies throughout the US. In the Great Plains states, wind farms are generally accepted for multiple-use, allowing farmers and ranchers to utilize their land more effectively. The low population densities and lack of substantial terrain relief of the Great Plains states varies dramatically from the densely populated areas of the eastern states, and the topographic relief in the western states. The siting of wind farms on ridgelines, or near population centers, runs into a unique conundrum where the wind farms are appreciated for their clean energy—but, often times, as long as it’s “not in my backyard” (NIMBY). This has lead to wind projects being significantly delayed, primarily due to visual aesthetics concerns rather than ecological issues. 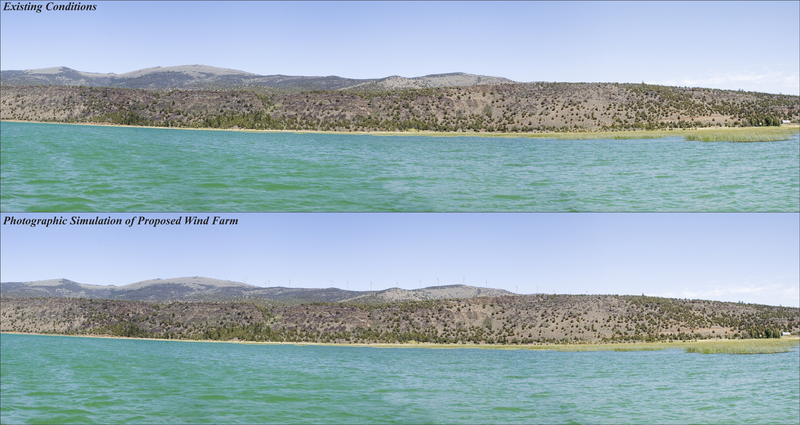 Though many environmental constraints can be mitigated, the subjective nature of visual aesthetics is making this one of the key sticking points for proposed wind farms. 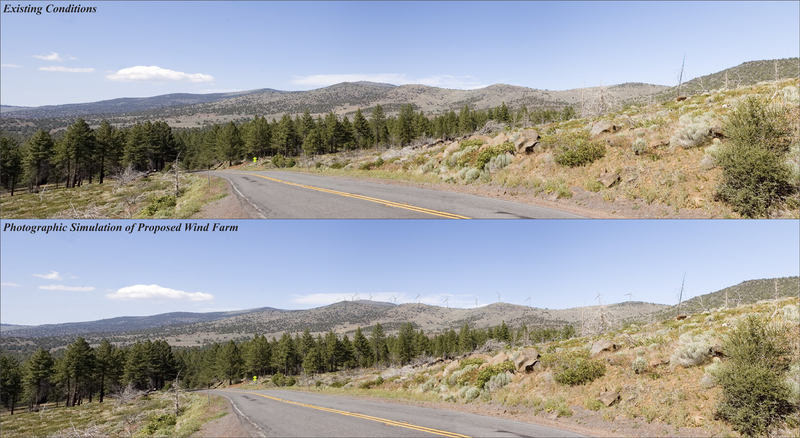 With plans to reach 20% wind energy by 2030, it’s inevitable that wind farms will become more contentious due to visual aesthetics as a fallback for “NIMBY-ism.” Integrating visual aesthetic considerations during the design phase will not remove all concerns, but will hopefully mitigate many stakeholder concerns and provide defensible documentation that visual aesthetics were considered throughout the project design process. As with any environmental constraint, the acquisition of resources and reference materials are integral to the design process. The same is true for visual resources. Acquiring site-specific and regional maps, relevant environmental documentation, environmental or design regulations, and recreational or tourist information are highly recommended. General site and regional maps, such as USGS and BLM topographic maps and US Forest Service maps, provide information to the topography, cultural, and environmental features within the project area. Past relevant environmental documentation, such as environmental assessments or impact statements, offers detailed insight into criteria important to the lead agency, stakeholders, and the public. 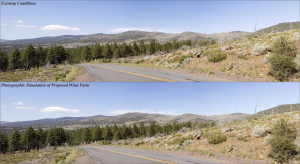 Environmental or design regulations, such as the BLM Visual Resource Management System or US Forest Service Scenery Management System, will guide the placement of turbines and describe sensitive areas. If possible, it’s highly recommended to obtain the scenic inventory notes that were used to classify specific visual resource management areas. Although, unless a resource management plan has recently been completed, such documentation tends to be tough to find. Generally, the most helpful information can be gleaned from either the local Chamber of Commerce or Tourist Bureau. Not only are these good places to find local recreation opportunities, but also a good place to get a good sense of the local recreational and population vernacular. In rural locations, it’s not uncommon to have unofficial recreation spots. These resources are often overlooked, but should not be. Many inquiries can be done anonymously without exposing project details, and while obtaining valuable information. Seen-area and viewshed analysis conducted from sensitive locations (population centers, recreation areas, etc.) are an invaluable tool to assist in the siting of turbine strings. This not only allows upfront knowledge of what may or may not be visible, but also allows engineers to utilize natural terrain features to mask portions of the development. By combining multiple seen-area analysis, areas of visual optimum and minimum can be generated. Utilizing the viewshed analysis and reference materials, regions around the project are identified for photographic inventory. At this stage, it’s important to involve whoever will be producing the photographic simulations. Photographic inventories should be zealously shot to reduce the necessity of multiple field visits, even though only a small percentage may be used for photographic simulations or determined as key observation points. The process to capture photographs for simulation purposes is fairly involved. 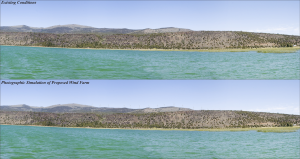 It requires capturing images at a specific focal length, determining the appropriate the field-of-view for panoramic shots, knowing the exact position and time of day, and accounting for issues such as parallax error and additional field-of-view measurements to assure accuracy of the final product. The photographic inventory is used, in part or whole, to determine key observation points from which photographic simulations are prepared for the alternatives—usually, in conjunction with the lead permitting agency. Many projects skip the importance of including visual aesthetics during the design process of a project, and they are left to the last minute during the permitting phase. The result could lead to getting an application filing and having the lead agency request additional information, which will inevitably delay the permitting approval. Active participation and interaction between the developer, lead developer, and the public goes a long way toward final approval of a project. By integrating visual resource early in a project, one can proactively take hold of their wind power project from the beginning and avoid unnecessary delays. Digital Data Services, Inc., is a geospatial service bureau combining technology, proprietary processes, and procedures to produce geospatial products and services including visual resource assessments, photographic inventories, viewshed analysis, and more. Zajímalo by mě, jak je to u nás a jestli se takové předběžné vizualizace vůbec řeší, například větřáky u Těšíkova, kde máme chatu, jsem docela dlouho nemohl přenést přes srdce, i když chápu jejich výhodnou polohu. To aby se člověk bál jít do lesa, když nad ním bliká armáda červených světel. I’m not sure how these things go in Czechia. I only know some architectural plans in the newspaper, which tries to evoke an impression of excellence planned buildings – for example Šantovka in Olomouc, “Ameba” library in Prague, etc. Visual impact assesment tools…. They compare different visualization methods according to their popularity among the public.